President Dwight D. Eisenhower once said, “In preparing for battle I have always found that plans are useless, but planning is indispensable.” If you are starting a business, you should have a business plan regardless of whether you are bootstrapping it or looking for outside funding. The best sorts of business plans tell a clear story of what the company plans to do and how it will do it. Given the high failure rate of startups in their first year, a business plan is also an ideal opportunity to safely test out the feasibility of a business and spot flaws, set aside unrealistic projections, and identify and analyze the competition. A business plan does not need to be complicated, but for it to serve its purpose and set you up for success, it must be clear to whomever is reading your plan that you have a realistic handle on the why and how your business will be a success. To get you moving in the right direction, here is a guide on how to write a business plan. There is a lot of advice in the infosphere about how to write a business plan, but there is no single correct way. Your approach depends on your industry, who is reading your plan and what the plan is intended for. Are you trying to get funding? 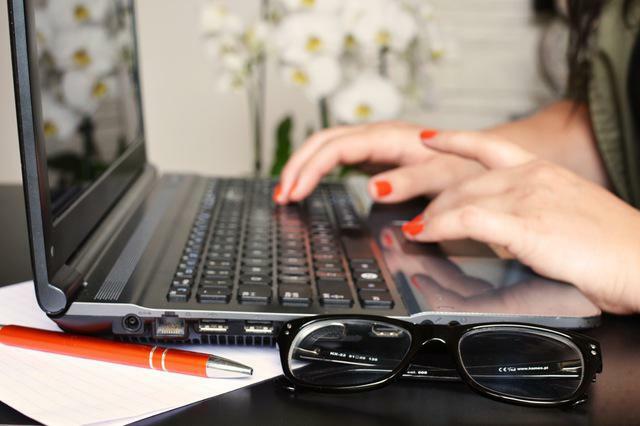 Sara Sutton Fell, founder of FlexJobs, a job site for flexible telecommuting jobs, said her business plan was an initiator for more in-depth conversation with potential investors. “A plan does help to see if investors and entrepreneurs are on the same page with general expectations for the business,” she said. • Have several versions tailored for specific audiences: “One of the mistakes that inexperienced business owners make is not understanding who they’re writing the plan for,” said David Ciccarelli, a small business owner who got consultation from his local Small Business Association (SBA) when he was starting his company Voices.com, which connects employers with voiceover talent. • Your plan is a living document: Tim Berry, the founder of a business planning software company Palo Alto Software, took his company from zero to $5 million (P230.27 million) in sales in its first three years. To do so requires frequent review and close tracking, said Berry, who met with his management team every month to review the plan versus what actually happened—and then to revise. “There is no virtue to sticking to a plan if it is not useful and responsive to what actually happens,” he cautioned. • Be realistic about financial estimates and projections: “When you present a plan to bankers and financiers, or even to your employees, people will get way more excited about what is real rather than some huge thing that is never going to happen,” said Ciccarelli. So present an achievable sales forecasts based on bottom-upwards information (i.e. how many units per month get sold in how many stores) and stop over projecting profits. • Back up any claims: Follow up your projections and assertions with statistics, facts or quotes from a knowledgeable source to lend your plan credibility. • Presentation counts: Reading any long, text-heavy document is hard on the eyes, so format with this in mind. Consider formatting your text pages into two columns and break up long passages with charts or graphs. Arial, Verdana or Times New Roman are standard industry fonts. Writing your business plan is not busy work or a luxury; it is a vital part of the process of starting a business and arms you with information you need to know. So, let us get into what information goes into your business plan. A typical business plan is 15 to 25 pages. Its length depends on a variety of factors, such as whether your business is introducing a new product or belongs to a new industry (which requires explanation to the reader), or if you are pitching to bankers, who generally expect to see a traditional written business plan and financials. “Most equity investors prefer either an executive summary or pitch deck for first contact, but will often request a more detailed plan later in the due diligence process. Potential customers do not need all the details of your internal operation. Your management team needs access to everything,” said Akira Hirai, managing director of business plan consulting service Cayenne Consulting. 1. Executive summary: The executive summary follows the title page and explains the fundamentals of your business. It should provide a short and clear synopsis of your business plan that describes your business concept, financial features, and requirements (i.e. cash flow and sales projections plus capital needed); your company’s current business position (i.e. its legal form of operation, when the company was formed, principals, and key personnel) and any major achievements in the company that are relevant to its success, including patents, prototypes or results from test marketing. 2. Business description: This section typically begins with a brief description of your industry and its outlook. Get into the various markets within the industry, including any new products that will benefit or hurt your business. For those seeking funding, reinforce your data with reliable sources and footnote when possible. Also provide a description of your business operation’s structure (i.e. wholesale, retail or service-oriented); who you will sell to; how you will distribute your products/services; the products/services itself (what gives you the competitive edge); your business’s legal structure, your principals; and what they bring to the organization. 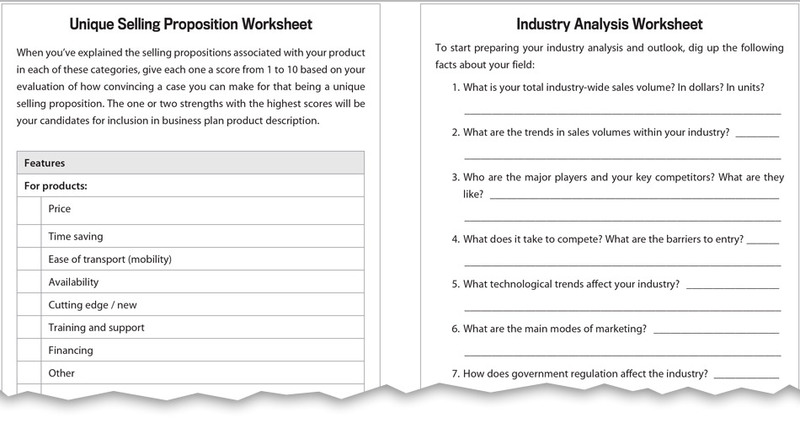 Here are some worksheets from Write Your Business Plan that will help determine your unique selling proposition and analyze your industry. 3. Market strategies: Here is where you define your target market and how you plan to reach them. Market analysis requires research and familiarity with the market so that the target market can be defined and the company can be positioned (i.e. are you a premium product or a price-competitive product?) in order to garner its market share. Analyze your market in terms of size, structure, growth prospects, trends and sales/growth potential. This section also talks about distribution plans, promotion strategy, and tactics that will allow you to fulfill your plans. 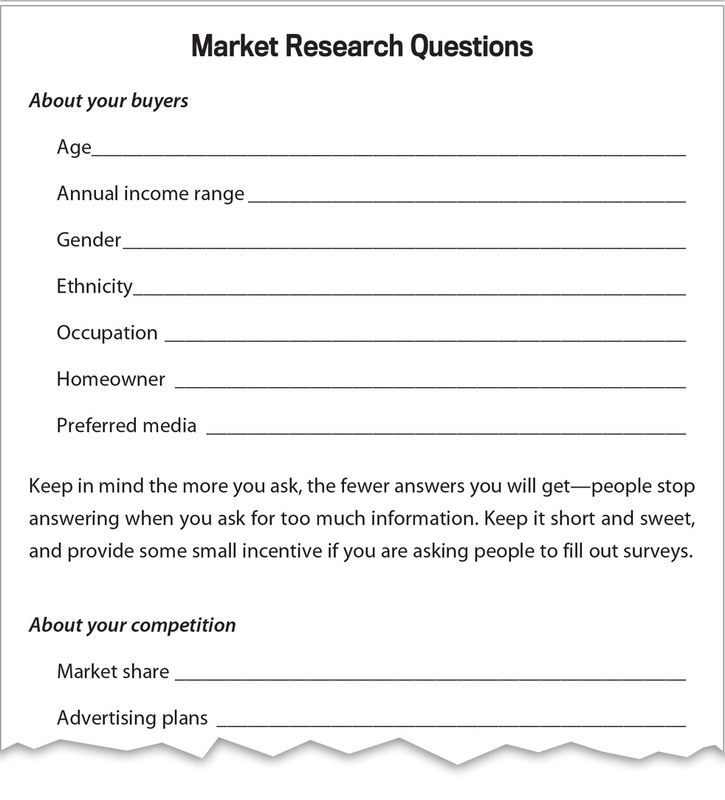 Here is a worksheet from Write Your Business Plan that will guide you toward identifying your target market. 4. Competitive analysis: The purpose of the competitive analysis is to determine the strengths and weaknesses of the competitors within your market, strategies that will provide you with a distinct advantage, the barriers that can be developed in order to prevent competition from entering your market, and any weaknesses that can be exploited within the product development cycle. Show why your business will be a success over others. 5. Design and development plan: You will only need this section if you have a product in development, such as an app. The purpose of this section is to provide investors with a description of the product's design, chart its development within the context of production and marketing and show a development budget that will enable the company to reach its goals. 6. Operations and management plan: This section describes how the business functions on a daily basis, its location, equipment, people, processes, and surrounding environment. If you have a product that needs to be manufactured, explain the how and where; also, describe your work facility, the personnel, the legal environment (such as licensing, permits, special regulations, etc. ), key suppliers, and inventory. This section will also highlight the logistics of the organization such as the various responsibilities of the management team and the tasks assigned to each division within the company. 7. Financial factors: Financial data is always at the back of a business plan—yet it is extremely important. The financial data can include your personal financial statement, startup expenses and capital, your projected cash flow statement, and 12-month profit-and-loss statement. PaloAlto’s Berry stresses that if you are going after investors, you will need to show a cash flow statement and a break-even analysis—or the breakdown to see where your business breaks even. The best way to prepare for running a business is to have all the components of the plan ready. So if you are are showing a prospective lender your business plan on 10 PowerPoint slides and get asked about something that is not in the presentation, you can speak knowledgeably and follow up with a more fleshed out plan—and quickly. Some business owners hire business plan writing services. Cayenne Consulting’s Hirai said that his clients generally fall into one of two categories: those intimidated by the process and those who could write the plan themselves but would prefer to spend their time on other priorities. If you find yourself intimidated or stuck, you can always write the parts of plan yourself that you understand and hire a consultant or researcher to help with parts that you find confusing. • Working plan: This plan is what you will use to operate your business and is not meant to be admired. This version of your plan is an internal document and will be long on detail, short on presentation. Here, you can omit descriptions that you need not explain to yourself or your team. • Mini plan: The reader may request a mini plan, or a condensed version of your business plan (1-10 pages), which includes most of the same components as in a longer traditional plan—minus the details and explanation. This includes the business concept, financing needs, marketing plan, financial statements (especially cash flow), income project, and balance sheet. This shorter plan is not meant to be a substitute for a full-length plan, but serves as an option to present to potential partners or investors. • Presentation plan: Whether you are using a pitch deck or a written business plan, the information in your presentation plan will be, more or less, the same as in your working plan but worded differently and styled for the eyes of an outsider. The reader of your presentation plan will be someone who is unfamiliar with your business, such as investor or venture capitalist, so lose any jargon or shorthand from your working plan, which only makes sense to you. Also, keep in mind that investors will want to see due diligence on your competition threats and risks as well as financial projections. In addition, looks count, so use the color printer, a nice cover, and bindings and the fancy paper stock. • What-if plan: This is a contingency plan—in case your worst case scenario happens, such as market share loss, heavy price competition or defection of a key member of your team. You want to think about what to do in the face of any of these, and if you are trying to get outside funds, having a contingency plan shows that you have considered what to do if things do not go according to plan. You do not necessarily need this, but if you are getting outside funding, then it can strengthen your credibility showing that you have thought about these what-if possibilities. Even if you are not going to get outside funding, should not you be thinking of the what ifs? If four plans seem like a mountain of work, do not panic. Select two to start off—a working plan and a mini plan, which will be an abbreviated version of your working plan. Take several months to write your business plan. Consider it a journey, not a sprint.